The Commission for the General Election (KPU) of Teluk Wondama Regency, West Papua, continues to spur increased voter participation in the area. 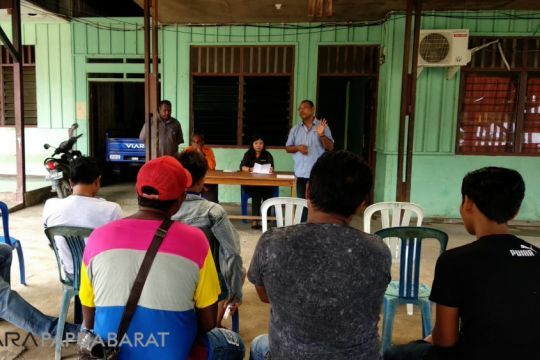 Head of the Socialization, Community Participation and HR Division, Teluk Wondama KPU, Hanok Baransano in Wasior, on Thursday, said that various efforts were made so that the number of people using their voting rights increased. “We have also formed a Democracy Volunteer who comes from various circles and on average comes from millennials. They are already running,” Hanok said. Recently, Hanok continued, the KPU conducted socialization for private employees. He said he hoped the community in various circles would protect various matters related to electoral affairs. “KPU wants to provide understanding for employees and employees related to the 2019 Concurrent Election so that they hope they can exercise their voting rights on April 17,” he said again. Other material presented to them included the Additional Voters List (DPTb), procedures for checking names on DPT and other important matters surrounding the 2019 Election. “They must understand that they are citizens, their participation is needed in the implementation of democracy and regional development in the future,” he said. Chairman of the KPU of West Papua, Amus Atkana in a separate interview, nationally the KPU targeted voter participation reaching 77, 5 percent of the total voter turnout in Indonesia. He is optimistic that West Papua can surpass this target. “If the center has a target of 77.5 percent, the West Papua KPU will increase by one digit, 78.5 percent. We have also instructed the regency / city KPU to increase one digit higher than the province, which is 79.5 percent of the total voters in each region, “he said again. Amus said that democratic volunteers had been formed in 13 regencies / cities in West Papua. The total number of volunteers in the area is 650 people. According to him, there are 10 sub-activities that will be carried out by volunteers in each region. The 10 activities will be carried out by five people each and they will enter all levels, including marginal groups, disability, voters to intellectual groups. “All of our potential plays, so that people in various circles get the right information about elections and democracy,” he said again. In addition to voter participation, Amus continued, he hoped the rewards presence would be able to ward off all forms of hoax and utterances of hatred on the implementation of the presidential election and legislative elections in this area. He wants the elections in West Papua to run smoothly, safely and peacefully.